Green Bean ponders gardening for gold. Eco-Novice posted a quote on Facebook last week which got me thinking. Growing food is like growing your own money. Ron Finley is on to something. You can save oodles of money by consuming your own produce. You can also trade or sell it. But why stop there? 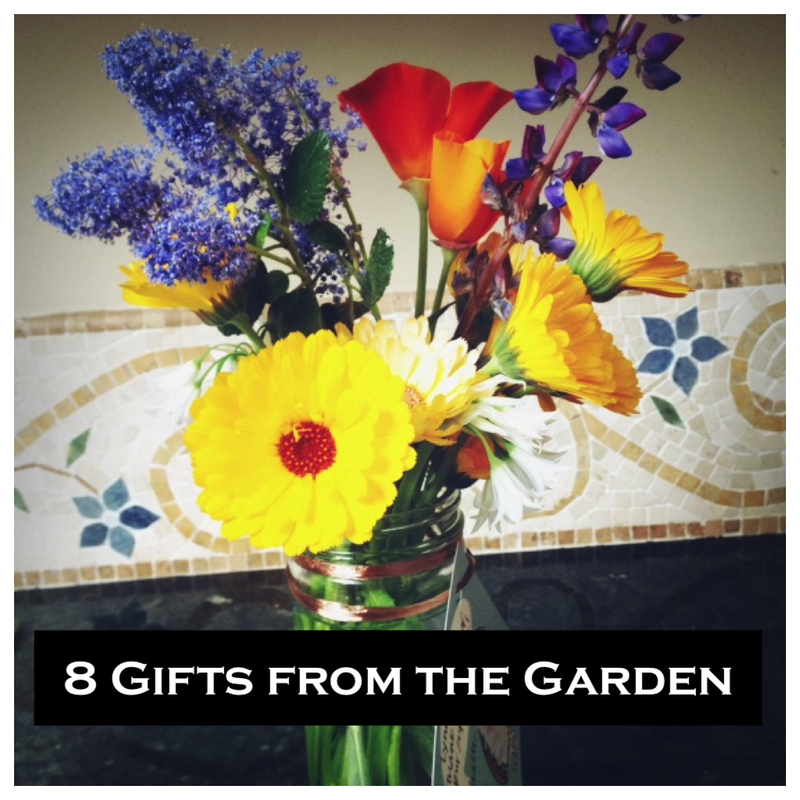 Turn your garden into a gift giving paradise and save even more dough. We've all seen Fresh Eggs signs on country roads but I took this photo in my densely populated suburb. I am grateful to so many people in my life. Friends who pitched in when I was sick. Teachers who went the extra mile with one of my boys. Neighbors who brought in the trash cans while we were out of town. Often, a nice note is sufficient to thank these people. But I cannot help it. I like to do a bit more. Theoretically, that bit more could be a Starbucks gift card or a box of chocolates. Instead, I give gifts from the garden. They mean more and cost less. Tie your produce up with a bow. Rainbow chard is particularly amenable to being trussed up with a salvaged ribbon. 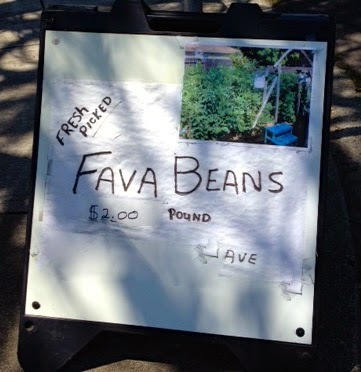 Collards and kale come in a close second but even a head of lettuce or a crisp paper bag of fava beans look lovely. Give fruit in a saved basket or a pumpkin as is. Not much is more beautiful than an heirloom pumpkin. Herbal bouquets are another great gift for foodie friends. Bonus: herbs are inexpensive to grow. Most of mine are perennials, purchased them years ago. Others, like basil, are a cinch to start from seed. Still others - parsley and chamomile - happily reseed themselves throughout the garden if you let them go to seed. (Birds and pollinators will thank you as well!) Poke in a few edible flowers - borage, calendula or nasturtium - for color. 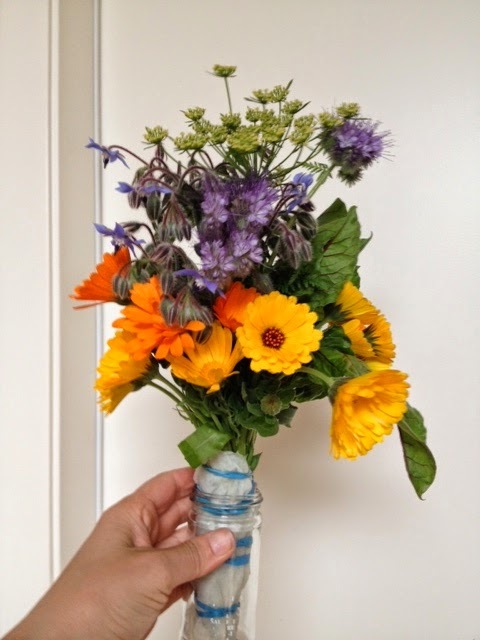 I often accompany my herbal bouquets with a handwritten note identifying the herbs. Chamomile reseeded from a previous year's garden. For non-chef friends, a flower bouquet is an old-fashioned gesture of gratitude and goodwill. When planting, go for flowers that readily reseed and do not be quick to deadhead. Free flowers for next year! As you pull together your bunch of blooms, do not omit flowering herbs, carrots or bolted greens. Those items offer structure and interest in a bouquet - and were headed for the compost or chicken coop anyway! Note the flower of parsley in the back. Bolted lettuce works just as well. Share a cup of tea. I stole this idea from a friend who made loose leaf tea for her kids' teachers. Dry chamomile, lemon balm, rose hips or mint leaves - all of which grow like weeds in my yard. Give the dried leaves and flowers in saved glass jars, neatly labeled, along with a thrifted, fancy tea cup. 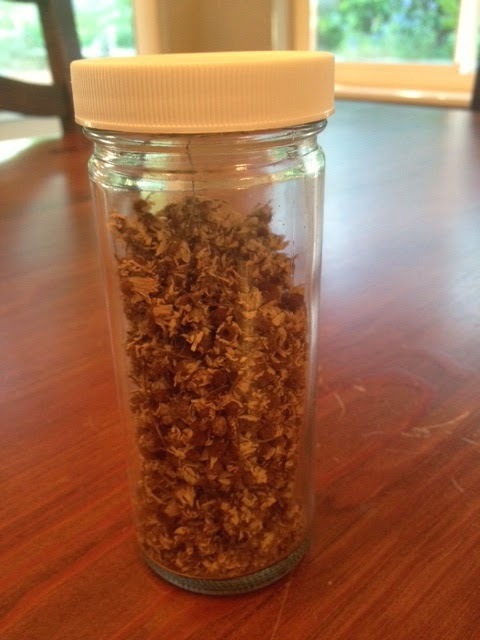 Dried chamomile flowers for tea. Jam and other canned goods. If you have mature fruit trees in your garden, chances are that you have more fruit than you can - or want to - consume. As sacrilegious as this sounds, no one in my family enjoys figs. Our home, however, came with a healthy, abundant fig tree. Hence, the jars of fig jam that I bestow from time to time. Apple butter is just as well received and also from our prodigious apple tree. Stick with smaller jars and a pretty label. It is the gesture, right? We are not looking to feed our friends for the rest of the year. Dried fruits and herbs are another wonderful gift. When drying herbs, apples, persimmons or whatnot, tuck a few inside of a pretty jar or wax paper bag and give them to some deserving friend. Photograph your bounty. Snap pictures of blooms, birds, butterflies and turn those into one of a kind note cards. I love taking my camera into the garden. It forces me to slow down and really study at all the garden's visitors. Finally, give the gift that keeps on giving: seeds and plants. Many annual flowers and some vegetables (beans, pumpkins) are a piece of cake to save. Stored in a jar or decorated paper envelope (let your kids do the decorating if it is for one of their teachers), they are a lovely gift for someone who gardens - or wants to. Plants - either propagated or from rhizomes dug up in spring - are equally wonderful gifts. If you save your nursery pots, the container is free as well as the plant! Berries, lemon balm, mint and mallow all wend themselves throughout my garden and are easy to pop into a pot and water until the plant is well established and primed for gifting. You are already doing a lot of work in your garden. Time to put your garden work for you! This post is part of the Tuesday Garden Party over at Oregon Cottage and the Homestead Barn Hop. Fabulous gift ideas! It's always so much more meaningful to receive a gift that the giver has had a hand in making. Personally, I think fresh produce/ herbs is the finest gift of all. I love your photos too, Green Bean!